مارتا پلیمپتن (اینگیلیسجه: Martha Plimpton) آمریکالی موغنی، مانکن و اوْیونچو ۱۶ نوْوامبر ۱۹۷۰ ‏ میلادی تاریخینده نیویورک شهرینده دۆنیایا گؤز آچیب. ۱۹۸۱–گۆنوموز ایللر آراسیندا سینما ساحه‌سینده چالیشیب. 1985 Family Ties Jessie Black Episode: "You've Got a Friend"
2002 Law & Order: Special Victims Unit Claire Rinato Episode: "Denial"
2003 Karen Sisco Chelsea Wentworth Episode: "The One That Got Away"
2003 Hack Louise O'Connor Episode: "Black Eye"
2004 7th Heaven Venus Episode: "Regret to Inform"
2006 Law & Order: Criminal Intent Jo Gage Episode: "Blind Spot"
2009 Medium Rosemary Widdick Episode: "Pain Killer"
2009 Grey's Anatomy Pam Michaelson Episodes: "Good Mourning", "Goodbye"
2010 Fringe Sheriff Ann Mathis Episode: "Northwest Passage"
↑ Albert, Brian (July 4, 2015). First Minecraft: Story Mode Details Revealed at Minecon. IGN. Ziff Davis. یوْخلانیلیبJuly 4, 2015. 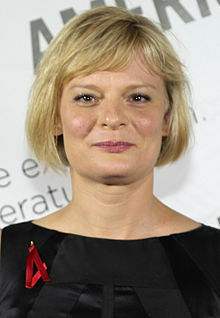 اینگیلیسجه ویکی‌پدیاسی‌نین ایشلدنلری طرفیندن یارانمیش«Martha Plimpton»، مقاله‌سیندن گؤتورولوبدور. ( ۲۱ دسامبر ۲۰۱۷ تاریخینده یوْخلانیلیبدیر). قارداش پروژه‌لرده مارتا پلیمپتن گؤره داها آرتیق بیلگی‌لر تاپابیلرسینیز.